I recently had my hair trimmed by Debbie Wilds at Shear Wildness Salon and Spa in Goochland. I couldn't have been happier with my new cut. If they can do such an excellent job with me (I've got major cow licks that are a challenge for any stylist), they can make anyone look great! 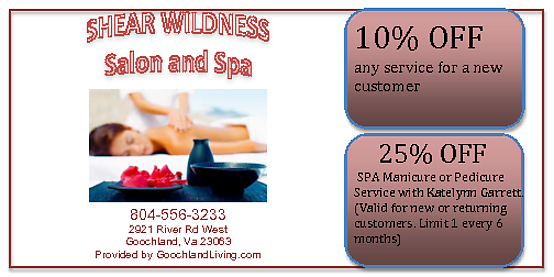 The nice folks at Shear Wildness wanted to offer this coupon Click Here , to people who visit GoochlandLiving.com. Perhaps a good Valentines Day Gift for the ladies? 10% Off any service for a new customer. 25% off SPA Manicure of Pedicure service with Katelynn Garrett, new or returning customers.